A burst of shocking pink climbs the Whitney’s north facade in Mary Heilmann: Sunset, a site-specific installation that inaugurates the Museum’s largest outdoor gallery and transforms it into a site of reverie, memory, and leisure. Mary Heilmann became known in the 1970s for vibrant paintings that married taut abstract forms with quivering line and vivid color. For more than thirty years she has intermittently explored a stair-step motif brushed within rectangular fields or expressed through irregularly shaped canvases, which happen to rhyme with the dramatic setbacks and grid lines of the Whitney’s new building. This serendipitous connection inspired Heilmann to enlarge a detail of one such painting and print it on two large panels that playfully turn the building itself into her canvas and tweak its sharp geometries. 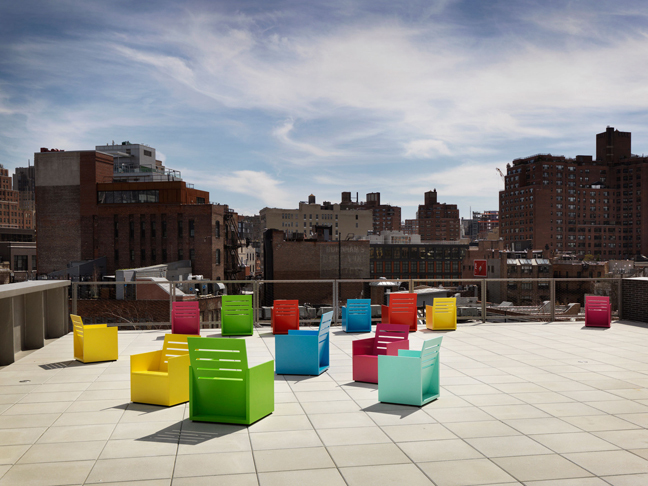 Heilmann’s intervention extends to a group of sculptural chairs scattered on the terrace like a shower of confetti. 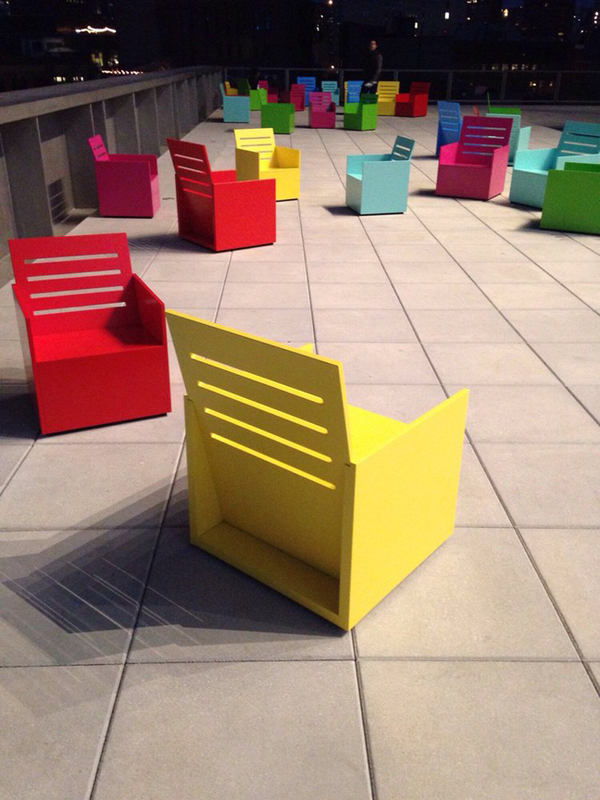 Adapted from furniture she has displayed in homes and exhibitions, the chairs serve as elements in her larger composition and encourage visitors to interact with one another and the cityscape beyond. 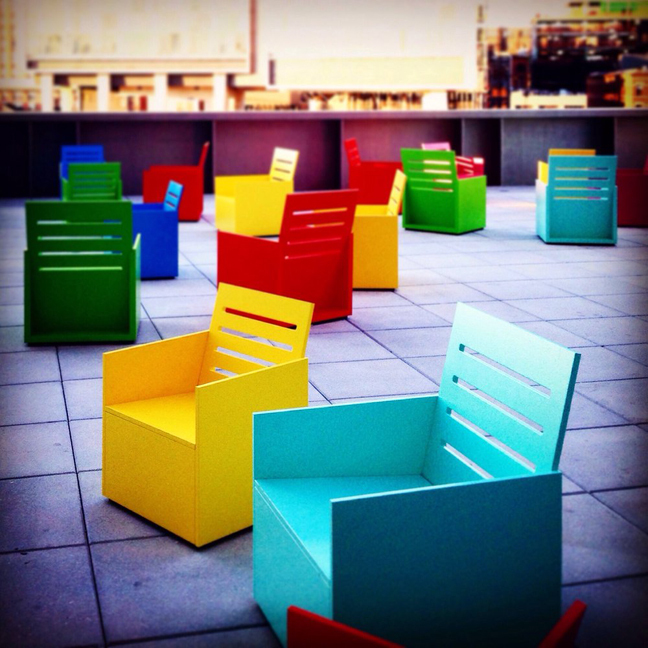 “Museums are places to hang out,” Heilmann says, as are New York rooftops. In 1977, Heilmann moved to Manhattan’s west side waterfront and documented the neighborhood the Whitney now calls home in her video Swan Song, made with Kembra Pfahler in 1982. Debuted here, this ode to a vanishing city provides glimpses of the light over the Hudson River, the destruction of the former West Side Highway, and the warehouses that dotted this ever-changing area. Heilmann’s exuberant installation knits the Museum’s architecture and visitors into their setting, inspiring colorful vistas, poignant memories, and fresh possibilities.